Today's CAS (Clean and Simple) Challenge at SCS is - CAS169 - It's time to be Chic!! I watched a video by the talented Valita on how to make this hat (I improvised a little because I didn't have the exact punches she did). I then just "winged" it to figure out the punch art stand. Really happy with how this turned out and think it is very "tres chic"!! Hope you like. I punched out the hat as per the instructions on Valita's video (click here). I then punched out the hat stand with Basic Black cardstock, using a small oval punch for the bottom, a medium oval punch for the top (cutting off a bit at the top so it fits inside the hat rim), and for the piece in-between, I punched two medium ovals quite close to each other and then used the shape in-between them for the post. 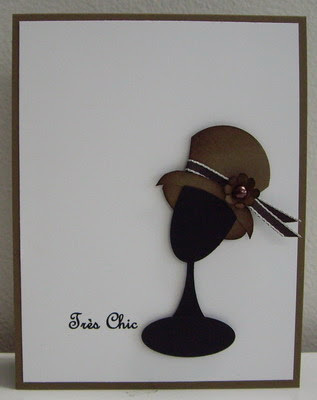 Your Tres Chic is very Chic indeed! One word says it all... F.A.B.U.L.O.U.S!!!! I am a day or two behind. But I love the hat and the gorgeous Lily too!!! Thank you for sharing!! !